If you want to understand who Mitt Romney really is, go beyond the position papers, stump speeches and preposterously presidential coif, and start with muffins. For most eaters, a muffin is consumed unthinkingly, in big messy bites, pawing last crumbs off the wrapper because, well, they taste good. For Mr. Romney, however, a muffin is an analytical challenge — a risk to be weighed. 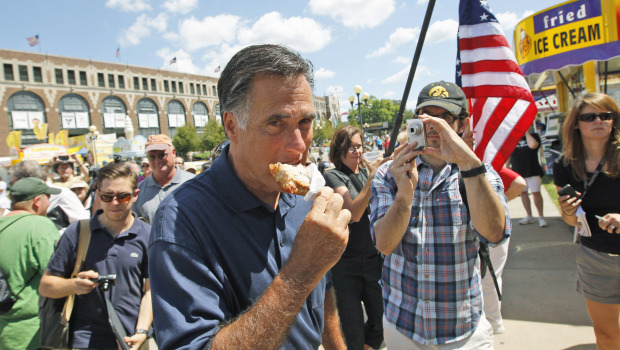 Indeed, eating muffins the Romney way takes discipline: He consumes the top, and only the top, to better avoid the unhealthy butter that supposedly flows downward during baking, according to an account by one of his biographers. When Mr. Romney takes the stage at the Tampa Bay Times Forum in Florida this week to accept the Republican Party’s presidential nomination, he will stand before America as many things. Proud father. Devoted husband. Wealthy financier. Devout Mormon. Self-styled economic turnaround artist. Threading through all that, however, the 65-year-old Mr. Romney stands as something else: a non-maverick. Four years ago, Republicans coalesced around John McCain, Mr. Maverick himself, and Sarah Palin, for whom going rogue was both the title of a memoir and a seeming campaign philosophy. Two political personas seemingly written in flickering neon; two candidates willing to saddle up in the casino of contemporary American politics and let it ride. This time, the GOP has a steadier, less flashy standard-bearer. Mr. Romney does not act impulsively. Nor does he take needless, heedless risks. Ambitious and accomplished, he is less a reckless slot-puller than a careful card counter. Case in point? In 1981, a park ranger told Mr. Romney that he couldn’t lower his boat into Massachusetts’ Lake Cochituate because the craft’s license number was too hard to read. Eager to go boating with his family, Mr. Romney asked how much the fine would be. Fifty dollars, he was told. Frugal enough to reportedly wear winter gloves patched with duct tape, Mr. Romney nevertheless did some quick mental math. The price of a ticket, he concluded, was worth an entire day of enjoyment. Clad in swim trunks, he began to move his boat into the water — only to have the agitated ranger take him into custody for disorderly conduct, a case that subsequently was dismissed. Contrary to popular late-night talk show monologue belief, Mr. Romney is not, in fact, an android, manufactured on the same Poli-Bot 2000 assembly line that produced the similarly awkward Al Gore. 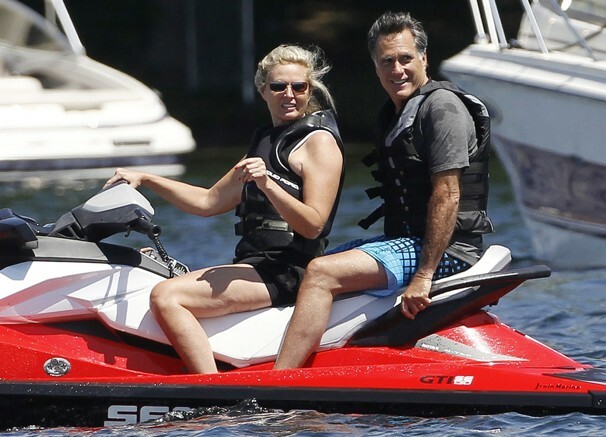 Away from business and politics, Mr. Romney enjoys water-skiing. He is fond of peanut butter and honey sandwiches. According to an old friend and former neighbor, he is an energetic — if mediocre — tennis player. He knows the joy of 18 grandchildren and the pain of a multiple sclerosis diagnosis for his wife. He loves “The Sound of Music”; he’s a fan of Coen brothers movies; he is not a fan of changing dirty diapers, which give him “dry heaves.” He tears up at church, gets nervous on airplanes and absolutely, positively cannot stand being late. In short, Mr. Romney is a regular, pants-on-one-leg-at-a-time human being, with hopes, fears and idiosyncratic quirks. Not that many people outside his inner circle would know it. 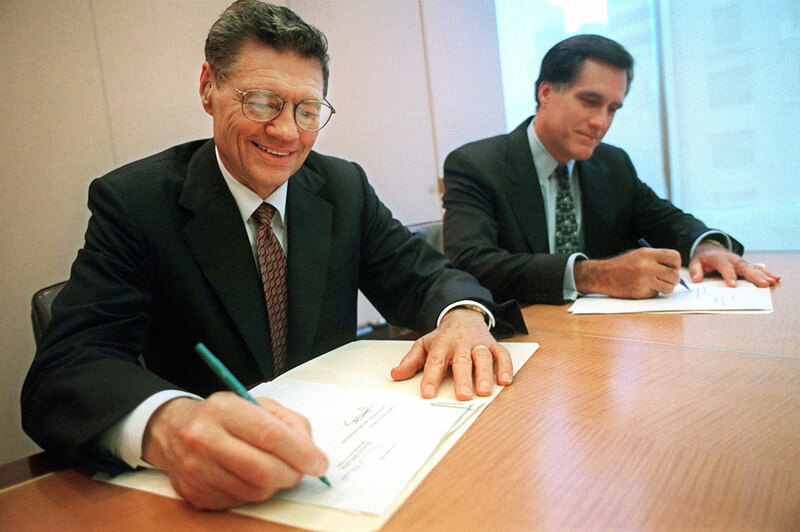 “I’ve been to Mitt’s home, skied with him, gone to his kids’ weddings,” said Tom Stemberg, founder of the office supply company Staples Inc. and a longtime Romney friend. “I had breakfast with him a few weeks ago. The image you get on TV of this cold, calculating guy is as far from the truth as you could imagine. True story: When Mitt and Ann Romney wed in 1969, they held their reception at a suburban Detroit country club. According to reports, a photographer asked to take a shot of the couple kissing. “Not for cameras,” Mr. Romney said. Despite spending the better part of the past decade in the public sphere, Mr. Romney remains something of an under-sharer. Other Massachusetts officials and former business associates paint a portrait of a friendly, detached man who isn’t big on small talk, sometimes seems uninterested in other people and would rather spend time with his family than socializing for work. Mr. Romney is active in his faith and proud of his family’s Mormon heritage. He seldom discusses religion on the campaign trail. Likewise, while examples of Mr. Romney’s personal charity abound — including the Christmas morning he brought presents to the home of an acquaintance whose sons had been injured badly in a car crash — the candidate prefers to keep those stories quiet. During an interview with Fox News last year, Mr. Romney was asked a relatively innocuous question: Name the last book you’ve read or one you’re currently reading. Conceding that “I’m reading sort of a fun one right now,” he declined to answer the query. “There’s the public Mitt and the private Mitt,” Mr. Helman said. “I’m told that within the Mormon community and with his family, he’s totally different. But he has long struggled in the political sphere to show a warm side of himself. Mr. Romney’s father, George, served as governor of Michigan and later was a Republican presidential candidate. Unlike his son, he also had a reputation for brashness. When the elder Mr. Romney took over American Motors Corp. in 1954, the automaker was on the verge of bankruptcy. As Mr. Romney later recalled in his book “Turnaround,” his father promptly sold his family’s Detroit home to buy AMC stock, then bet both the company and his family’s future on a fuel-efficient car, the Rambler, that could travel as many as 30 miles per gallon of gas. Marked by ambition and accomplishment, Mr. Romney’s business career also serves as a study in bases-covering prudence. After graduating with stellar grades and a joint degree from Harvard’s business and law schools in 1975, Mr. Romney had little trouble landing a job in business consulting, an emerging field that was heavily recruiting the Ivy League’s best and brightest. Nevertheless, Mr. Romney also took and passed the Michigan bar exam — if consulting didn’t pan out, he calculated, he could always work as a lawyer for the auto industry. Years later, the head of Mr. Romney’s consulting firm, Bill Bain, asked him to head a new kind of investment firm, based on a novel concept of investing in startups and distressed companies, improving their performance through rigorous analysis and then selling them for profit. The venture was called Bain Capital. It eventually would surpass all expectations, making Mr. Romney a multimillionaire. Mr. Romney had a young family. He was doing quite well as a consultant. He did not want to risk his reputation or earnings on a fledgling company, especially one with an unproven business model. Then, and only then, did Mr. Romney say yes. At Bain Capital, Mr. Romney largely avoided investing in high-risk, high-reward startups, preferring to acquire established businesses that could benefit from data analysis and improved management. The firm also mitigated risk through leveraged buyouts. How so? Rather than purchase companies entirely with Bain money, Mr. Romney and his partners would invest a portion of the purchase price and borrow the rest from banks, with the acquired companies themselves responsible for loan repayment. In a $200 million deal for Accuride, a company that made wheel rims for trucks, Bain Capital invested just $5 million and borrowed the rest of the purchase price. After Accuride’s earnings rose 20 percent under Bain’s management, the company was sold for a $121 million profit. When Mr. Romney entered politics and ran against Edward M. Kennedy for a U.S. Senate seat in 1994, his candidacy appeared audacious, if not downright quixotic: Ted Kennedy was a longtime Democratic incumbent in a liberal-leaning state, the surviving scion of a political dynasty and a larger-than-life fixture in national politics. Time and again, a former business associate said, Mr. Romney follows a three-step pattern when taking on major challenges: first, pooh-pooh and stress-test the idea; second, crunch data to come up with the best possible plan; third, attack the problem with stubborn determination. In high school, Mr. Romney ran cross-country. He was more tortoise than hare. As his biographers recount, he once failed to pace himself during a 2.5-mile race held during halftime of a football game. Cramping and falling down repeatedly, Mr. Romney finished dead last. He crawled across the finish line. He did not give up. Mr. Romney’s successful turnaround of the scandal-ridden Salt Lake City Olympic Games — and his ongoing, six-years-and-counting bid for the White House — could be viewed as variations on the same theme. One gaffe was all it took. During a 1967 television interview, presidential candidate George Romney said he had been subjected to “the greatest brainwashing” by American generals and diplomats during a visit to Vietnam. George Romney’s campaign never recovered. Among political observers, it’s an article of faith that Mr. Romney — who adored and idolized his father — has vowed to avoid the same mistake. Mr. Romney’s sister, Jane, concurs. Speaking to the Wall Street Journal, Mr. Romney disagreed, saying, “I don’t think my father’s comment figures into my thinking at all.” Maybe so. Perhaps, as Mr. Helman and Mr. Kranish write, Mr. Romney inherited his “tact and even temperament” from his mother, Lenore. Whatever the case, Mr. Romney’s cool detachment is not an act. A longtime friend and former co-worker said he has seen Mr. Romney become visibly agitated “only a handful of times” and has never heard him raise his voice. Mr. Romney’s coolness reflects a strong analytical bent. In meetings, he reportedly loves playing devil’s advocate, pushing and pressing others, stirring up debate to tease out risk and reward. He puts his faith in data. In knowing every angle and option, every pro and con. Mr. Romney wanted to cover the uninsured. He did not want to raise taxes. He believed an individual mandate to purchase health insurance — now controversial, but originally a conservative idea — was a morally justifiable way to do so, given that it would solve the problem of “free riders,” people who could afford insurance but did not buy it. Though Mr. Romney’s prudence and reticence seem innate, they also have been shaped and reinforced by experience. In some ways, Mr. Helman said, the candidate has grown up in a series of social bubbles: an elite, Detroit-area private school; a tightly knit Mormon community; a single year at Stanford — then in the early days of the 1960s counterculture revolution — followed by a Mormon mission in France; a return to the familiar, mostly Mormon environment of Brigham Young University; a subsequent plunge into fatherhood, family life and an oft-staid professional world. Mr. Romney was born into relative privilege. His father ran for president. His mother was once a successful Hollywood actress. His family is prominent in the Mormon church. With privilege comes high expectations, both internal and external. At some level, Mr. Romney likely knows this. After all, his character traits as described by associates — dutiful, driven and careful — are those of a man who has been dealt a winning hand, and is trying very, very hard to not mess things up. During the Republican primary season, Mr. Romney registered historically low likability ratings — in part because his detached style and discomfort with meet-and-greet retail politicking made it difficult for him to connect with voters, in part because the psychological firewall he erects between his public and private lives made it hard for his campaign to provide the public with a clear sense of his personality. Conservative voters have struggled with a similar question: Ideologically speaking, what does Mr. Romney actually believe? In Massachusetts, Mr. Romney ran for Senate and governor as a moderate Republican, expressing support for abortion rights, limited gun control and gay rights; in 2008, however, he ran for president as a social conservative, expressing changes of heart on all three issues. From an outcome-oriented, engineering perspective, the shifts made perfect sense: Massachusetts was a liberal state unlikely to elect a hard-right candidate, while Mr. Romney’s best chance to defeat primary rivals Rudolph W. Giuliani and Mr. McCain was to tack right and woo disaffected religious conservatives. From a political standpoint, however, Mr. Romney’s reversals further muddled his already enigmatic image. Mr. Romney seems aware of his political shortcomings. His recent selection of Rep. Paul Ryan of Wisconsin as a running mate was hailed by many observers as uncharacteristically bold, even risky — but also can be read as a savvy, calculated move to boost enthusiasm and shore up support among the Republican conservative base. The race for the White House is many things: democracy in action; a cable news carnival; an ingenious way of redistributing wealth from eccentric billionaires to swing-state television stations. Mostly, though, it’s an extended job interview. Mr. Romney beat out his Republican primary rivals largely on the strength of his resume — but his general election fate may be determined in part by his willingness to share the rest of himself and risk rejection in the process. During his freshman year at Stanford, Mr. Romney repeatedly returned to Michigan on weekends to visit his future wife, one time driving nonstop from California. He kept the visits a secret from his parents, who wanted him to focus on his studies. Eventually, George Romney found out. He planned to trim his son’s allowance. Mr. Romney did the math. From his dorm room, he auctioned off his clothing; with the money, he bought a plane ticket to see Ann. On Thursday night, Mr. Romney will reintroduce himself to Republicans and America alike, talking about things that are important and dear to him, the first kiss of a political marriage. There will be pictures.